The band (which came together in 2011) is very much a super-group. Those first two names might ring a bell for some as they both played with Whitesnake. Meanwhile guitarist Laurie Wisefield was in Home and Wishbone Ash as well as playing with Tina Turner, Joe Cocker and Roger Chapman. He was also part of the cast of We Will Rock You. Drummer Harry James played with Magnum and Thunder. Keyboardist Adam Wakeman (the son of Yes' keyboardist Rick Wakeman) has worked with quite a few artists ranging from Atomic Kitten to Black Sabbath! And finally, in addition to a solid solo career, Chris Ousey spent time with Virginia Wolf and Heartland. So, there is a TON of talent behind this project. For once all that talent actually amounts to something! I know, crazy right? This self-penned/self-recorded project only gets better as it goes along and better with each new listen. It's a swirling blend of blues rock, melodic rock and classic rock. Musically it all comes together in a way in which this record sounds like a well-loved LP of old. Almost as if it were something your parents would have pulled out and played when you were younger (or at least younger and having grown up in the seventies/early eighties). If you can't picture the beauty of this old-school charmer then fear not. For a point of reference it's a mixture of early Whitesnake, early Foreigner (in a good way! ), Bad Company, Led Zeppelin and Gary Moore. 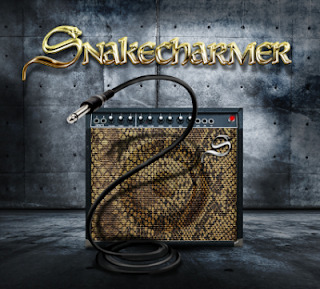 It's timeless as well as modern and it's a real home-run for both Snakecharmer and Frontiers Records. This one is going to get plenty of listens in my household.